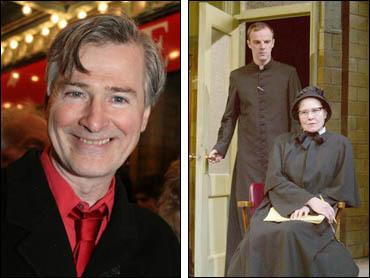 "Doubt," John Patrick Shanley's drama of suspicion and certainty set in a parochial school in the Bronx, was named best play as the 2005 Tonys celebrated the best of a busy Broadway theater season. "Monty Python's Spamalot," an irreverent romp inspired by the British troupe's film "Monty Python and the Holy Grail," took the prize for best musical, as well as for director Mike Nicholas and actress Sara Ramirez, who portrays the diva-like Lady in the Lake in the zany spoof. A somewhat flustered Nichols told the audience he had forgotten what he intended to say, but went on to thank his company and "Spamalot" creator Eric Idle, "from whom all blessings flow." Yet more Tony awards were won by "The Light in the Piazza," a tale of young love in old Europe. It received six Tonys, including best score for composer Adam Guettel, grandson of the legendary Richard Rodgers. "Doubt," the season's most honored play, already had picked up the Pulitzer Prize, the New York Drama Critics' Circle Award and several other top play prizes. "Happy. Joy. Fleeting," Shanley began his acceptance speech, adding: "I want to thank the Sisters of Charity for teaching me how to read and write. I want to thank the Irish Christian Brothers for throwing me out of high school." "Doubt" also captured two acting Tonys - for star Cherry Jones and for featured performer Adriane Lenox. Jones, winning her second best actress Tony, was honored for her fierce, yet often funny portrait of a determined, unrelenting nun. Lenox plays the mother of a boy who may have been molested by a priest. The director of "Doubt," Doug Hughes also won. "It must seem like a wild act of Oedipal revenge for the son of two actors to become a director, but I assure you that's not the case," said an emotional Hughes, the son of theater veterans Barnard Hughes and Helen Stenborg. Bill Irwin captured the actor/play prize, winning for his portrayal of the henpecked George in a blistering revival of "Who's Afraid of Virginia Woolf?" "Piazza" also won for its star, Victoria Clark, who plays a Southern matron shepherding her mentally challenged daughter on a tour of Italy. Its other prizes were for sets, costumes and lighting in the musical design categories as well as for orchestrations. Norbert Leo Butz, an exuberantly obnoxious con man in "Dirty Rotten Scoundrels," captured the prize for actor/musical. "I feel like crying because when I heard my name, I just got the joke," Butz said. "No way that someone with my name ... could be in Radio City Music Hall holding one of these." To his co-star, John Lithgow, also nominated, he held his trophy aloft and said, "I have one of these, but you have what I really want, the respect and gratitude of everyone in this community." "The Pillowman," the closest competitor for "Doubt," won two design/play awards: for sets and lighting. The costume/play award went to "The Rivals." The choreography prize was taken by Jerry Mitchell for the athletic dances he created for the revival of "La Cage aux Folles," which also won the prize for musical revival. The play revival award went to a production of David Mamet's "Glengarry Glen Ross." "I feel like Rocky right now," said Dan Fogler, who got the prize for his portrayal of the nasally challenged but expert wordsmith in "The 25th Annual Putnam County Spelling Bee." "I was going to dance up here," said Fogler, whose talented feet spell out words in "Spelling Bee," and then thanked his parents for their support - and "the DNA." A stunned Liev Schreiber took the featured actor/play prize for his portrayal of a sleazy real estate salesman in "Glengarry Glen Ross." "To be part of this ensemble is an amazing experience for me," Schreiber said of the other actors in his show, which includes Tony nominees Alan Alda and Gordon Clapp. "I'm so grateful." The musical-book prize was won by newcomer Rachel Sheinkin, who wrote "Spelling Bee." Billy Crystal walked out to open the show at Radio City Music Hall and launched into a monologue as if he were hosting - as he has several times with great success at the Academy Awards. "Welcome to the 59th annual Tony awards, or as CBS calls them: `CSI: Broadway,"' he said, then joked that all of the nominated songs would be sung by Beyonce - "in French." But then Crystal got a cell phone call from Hugh Jackman, the show's real host, who, of course, wrested the hosting duties from him for the rest of the night. Jackman served as host for the third year in a row. Crystal later won the award for special theatrical event - a one-man show titled "700 Sundays" - and cracked: "I want to thank everybody in behalf of the entire cast." A special lifetime achievement Tony was given to playwright Edward Albee, author of such classics as "Who's Afraid of Virginia Woolf?" and "A Delicate Balance," among other plays. "If they wait until you do achieve lifetime work, you probably will have died. This is better," said Albee. He dedicated his honor to the memory of his partner of 35 years, sculptor Jonathan Thomas, who died in May after battling cancer: "He made me a happy playwright. And you have made me a happy playwright tonight." The eclectic Theatre de la Jeune Lune, run by a collective of artists in Minneapolis, was awarded the regional theater Tony.